However, pirates can still dodge this update by simply not opting to install it or even uninstalling it from Windows Update -> Installed Updates section, they can even restore to a pre-KB971033-update state as Windows creates an automatic restore point before installing updates. This update for Windows Activation Technologies helps detect validation errors and activation exploits. This update also detects any tampering attempts made to important Windows 7 system files. Be aware that some counterfeit copies of Windows include malware. Sn0wBreeze 3.1.3 update is now available for download allowing users to create custom 3.1.3 IPSW restore files while retaining the older baseband so they can still enjoy existing blacksn0w or ultrasn0w iPhone unlocks. To get iPhone OS 3.1.3 with jailbreak and carrier-unlock all you need to do it to create a custom IPSW file using Sn0wBreeze 3.1.3 (download link after the jump) and restore you iPhone with this newly created IPSW file having older baseband. You can download the latest Sn0wBreeze 3.1.3 from here (link updated to newest sn0wbreeze-V1.5.1.zip) and follow the older Sn0wBreeze usage guide to create your customized iPhone restore file. There is nothing exciting or worth upgrading in iPhone OS Update 3.1.3 but if you still want to upgrade and keep the jailbreak it is now very much possible thanks to updated redsn0w 0.9.4 utility by iPhone Dev Team, do keep in mind if you are using an unlocked iPhone do not upgrade as no unlock is yet released for iPhone OS 3.1.3. After pushing the iTunes 9.0.3 update yesterday Apple today released the iPhone OS 3.1.3 for iPhone and iPod Touch users, the latest update to iPhone firmware offers basic bug-fixes and stability improvements as detailed after the jump. • Improves accuracy of reported battery level on iPhone 3GS. • Resolves issue where third-party apps would not launch in some instances. 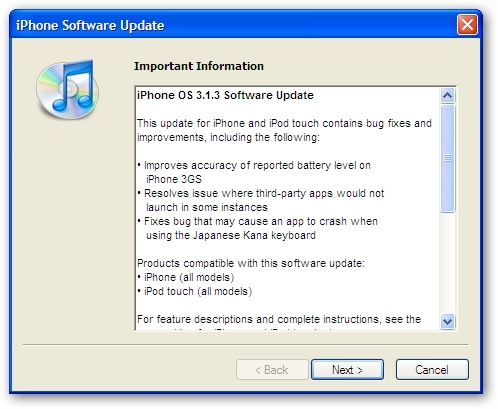 • Fixes bug that may cause an app to crash when using the Japanese Kana keyboard. If you care about your jailbreak and unlock, don’t update your device - 3G and 3G(S) owners should pay particular attention to this warning. * There is no estimated release time for compatible tools (please don’t bug us about this). * Any information we have regarding this update will be posted here. 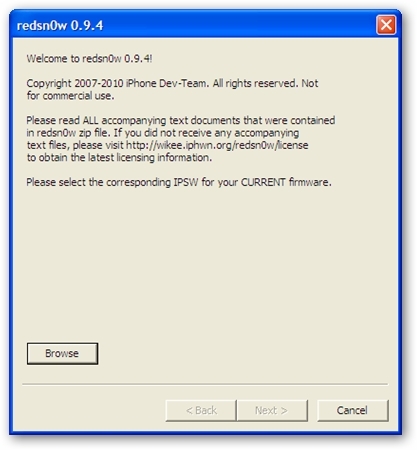 Update 3: [Don’t go near this if you have 3GS, newer ipt2G, or any ipt3G] For those with older (non-MC) iPod touch 2G, we’ve compiled a special version of redsn0w meant just for you: Mac and Windows. You guys can get in on the “3.1.2 loophole” too using this special version. Don’t try this if you have a newer iPod Touch 2G or if you’re not completely sure what version you have. And of course don’t try it for 3GS or ipt3G either. That about does it for the 3.1.2 redsn0w loophole. It can only be used by: those who don’t need the 3G/3GS unlock, and only owners of iPhone 2G, iPhone 3G (not unlockers! ), iPod 1G, and iPod 2G older version. Everyone else please wait for official support in the tools.
. A study by research firm IDC, The Risks of Obtaining and Using Pirated Software, shows that one in four Web sites offering counterfeit software attempted to install unwanted or malicious code upon downloading. And this rate is rising. Media Surveillance, an anti-piracy solutions company based in Germany, recently downloaded more than five hundred pirated copies of Windows 7 (and Windows activation exploits) and found that 32% contained malicious code. These are very disturbing figures – especially when considering that resellers may be using these downloads to claim that the PCs they sell include genuine Windows.
. If Windows 7 is non-genuine, the notifications built into Windows 7 will inform the customer that Windows is not genuine by displaying informational dialog boxes with options for the customer to either get more information, or acquire genuine Windows. The desktop wallpaper will be switched to a plain desktop (all of the customer’s desktop icons, gadgets, or pinned applications stay in place). Periodic reminders and a persistent desktop watermark act as further alerts to the customer. As this update looks like a separate download from WAT it will be possible to detect WAT removal from user computer and decide that the copy is indeed a pirated one. We all know how costly is printer ink but Japanese company PrePeat is all set to change that with their innovative ink/toner less rewritable printer-paper combination, the special re-printable paper is made of PET plastic and can be used 1000 times, for more see the video demo. The Free2Play concept is gaining quite some popularity as two big game titles Quake Live and Need For Speed: World Online have already announced the online version of the games to be completely free-to-play and now EA Sports has started closed public beta of their upcoming Free-to-Play game FIFA Online. Free-to-play football game for PC. All the up-to-date teams and leagues you’ve come to love in the FIFA franchise. New features not seen elsewhere in football videogames. 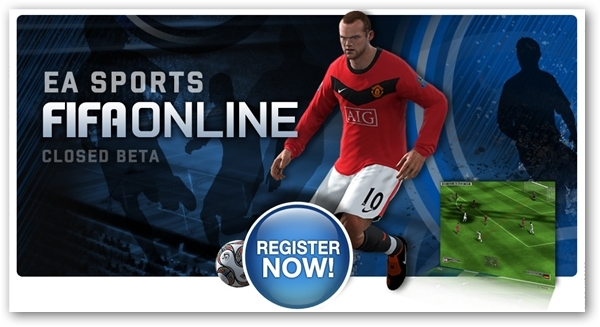 If you are interested in beta-testing and playing EA SPORTS FIFA Online before the official public release, simply visit this page and apply. George Hotz a.k.a GeoHot - the same guy who gave the world first ever iPhone exploit has finally pwned the Sony PlayStation 3 (PS3) by achieving read/write access to the entire memory system of the console including HyperVisor level access to the processor, which in plain english means that it's now a matter of time to reverse-engineer the internal software and get it hacked for whatever purpose without removing the NAND or using a modchip. We earlier exposed how pirates were enjoying unlimited non-blacklisted officially supplied Kaspersky Keys exploiting the beta licensing loophole in both Kaspersky Anti-Virus and Kaspersky Internet Security, surprisingly even after the expose the loophole existed in KAV 2010 and KIS 2010 updates but now after a long-time the company has finally patched it and it is not working anymore.